A bit of an update...and for details and pics you can scroll back 75 posts! from October 2006 on when it all began...all the time working through ICA CANADA, an NGO out of Toronto and with our sister NGO's in Zimbabwe, Kenya and Tanzania. (Institute of Cultural Affairs). THANK YOU SO MUCH to everyone who has helped to make these dreams come true....without your help absolutely none of this would be possible...I feel going over there this time a sense of bringing everyone with me, so many great wishes, and enough money now to finish the renovations and order the furniture for the new building: bunk beds for about 30 kids, tables, benches, desks, kitchen stuff....new clothing, linens, etc...and then the big move! The bags are almost packed..pictures and tshirts of Obama, six measuring tapes, graf paper, pencils, pens, art supplies for the kids, camera, a bag of batteries..a video camera and this year thanks to Lindsey and Jim batteries for the mic! Last year I came home with the best footage, but NO SOUND!! Bug spray, suntan lotion....passport and yellow fever card..you don't need a lot...KLM to Amsterdam..then off to Gottenburg Sweden for two nights meeting with great Swedish friends who have helped sponsor Huruma, just came back...back to Amsterdam Sunday, Merit at the airport picking up winter clothes, 8 hours to Nairobi, a shuttle to Arusha, six hours...Charles...He will be there! Nothing is ever cetain, but everything always works out, African time! Things don't run the way we try to control them here, course that never works either, but hey, we try! Write me, at lynnconnell@sympatico.ca...I promise to write back! It's fun getting news ..over in Mto Wa Mbu there's no CNN, no CBC...no Harper!! For those of you who want to know more about HURUMA ORPHANAGE...here we go! 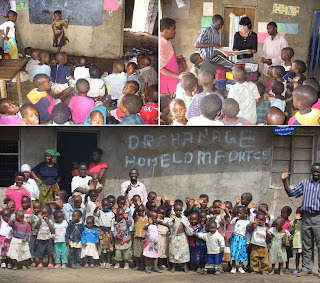 In March last year, Charles took me to visit the newly-formed HURUMA Preschool and Orphanage, on the outskirts of Mto Wa Mbu in an agricultural farming area where ICA TANZANIA has worked on HIV AIDS projects for the last 3 years. I saw 52 little children, ages 2-6, orphaned by HIV AIDS, sitting on the mud floor of a dark, leaking foyer inside a farmers home, with one teacher, one director and two women cooking corn broth outside in a rickety stick kitchen. 10 children were living in one room on two beds – the boys on one, the girls on the other, squeezed in and sleeping in a row, width-wise. The rest lived with family or neighbours. The Orphanage had nothing: no tables, no benches, no books; no clothing but for the tattered, filthy rags on their backs. But they were delighted! that something, anything, was being done for them. Charles knew well the director and local elected counselors on the HURUMA board, having worked on HIV AIDS awareness with them over the past three years. They had been denied official registration status as the place was unfit for children. Charles located a large home on the same street which was vacant and 90% finished. He contacted the owner, and contracted for four years the use of her home, in return, HURUMA would finance the renovations of: electrical, plumbing, floor, windows, doors, roof, plastering and painting, outdoor kitchen and bathroom facilities, laundry, landscaping. Our ICA Tanzania nurse Elizabeth tests kids for HIV AIDS, with only 2 positive, great news. We photograph each kid and take brief histories. In April 08, Back in Toronto, we began to raise money to finance the renovations...and with YOUR help! we did it!! Friends, Rotary, acquaintances, even complete strangers..it has been fantastic! What a team! Thanks so much!! *ICA TANZANIA: (ICA: Institute of Cultural Affairs) an international NGO focusing on HIV AIDS awareness, prevention, counseling, volunteer testing. There are 32 ICA’s around the world, 7 in Africa. I originally went to Africa with ICA CANADA.